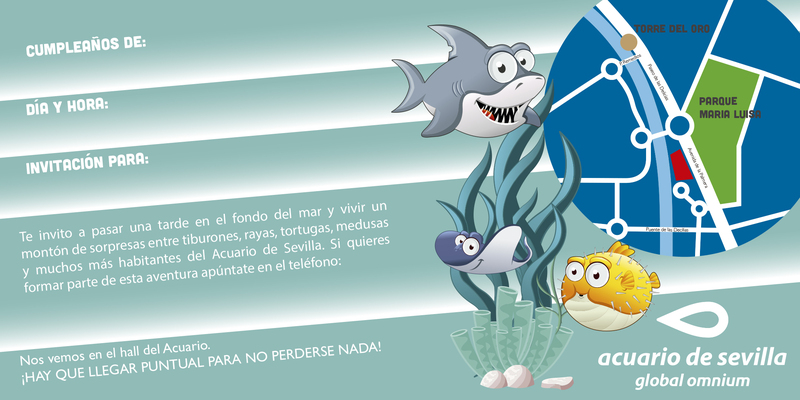 Come and celebrate your birthday surrounded by sharks, turtles, rays and many more inhabitants of the Aquarium! The most original party ever! Lots of fun under the sea! What does include? The birthday in the Aquarium consists of a snack in the cafeteria + a guided tour for the children. The snack menu for each child consists of: Sandwich or hot dog, mini pizza, snacks and trinkets, plus a drink to choose from: water, soda, juice or smoothie, and a slice of cake (to choose among several flavors) . Optionally they can do the workshop "Fish want to celebrate years" (check prices). Parents may be present at the birthday snack. Once the visit to the Aquarium begins, the participants will stay with the educators. If the group exceeds 15 children, the host is free. Print the invitation to give it to your friends!